TV show dates: December 14, 2015 — present. 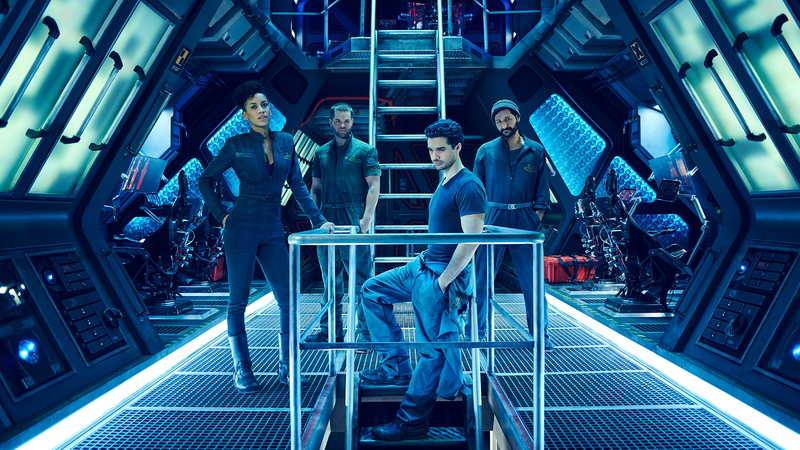 Performers include: Thomas Jane, Steven Strait, Shohreh Aghdashloo, Dominique Tipper, Cas Anvar, Wes Chatham, Florence Faivre, Paulo Constanzo, Chad L. Coleman, and Jared Harris. Based on the James S. A. Corey book series, this science fiction mystery series is set centuries in the future. Earth’s population has ballooned to over 30 billion, and the planet is now under UN control. Humans have colonized Mars and the Asteroid Belt. Mars is an independent power. The Asteroid Belt is exploited for resources. Earth, Mars, and the Belt are edging towards war. When champion light spacecraft pilot Julie Mao (Florence Faivre) goes missing, the search for her exposes an incredible conspiracy. Born to one of Earth’s wealthiest families, Mao fell out with her father and turned her back on him and his riches. After joining The Far Horizons Foundation, she campaigned for Belters’ rights, until her disappearance. Jaded and defiant, Detective Joe Miller (Thomas Jane), was born and raised on Ceres Station. Until he straightened up his act, the orphaned Miller was headed toward a life of crime. By working for Star Helix, he is working for the oppressor — Earth. Montana native Jim Holden (Steven Strait) is the only child of a genetic group made up of eight parents. Holden joined the UN Navy to avoid joining his family’s lost cause — preserving the last bit of undeveloped land in Montana. Before being courtmartialed and dishonorably discharged, Holden rose to the rank of First Lieutenant. Now serving as 2nd Officer of Pur’n’Kleen’s Canterbury ice hauler, he enjoys the freedom of his position. UN politician, Chrisjen Avasarala (Shohreh Aghdashloo), is the daughter of a longstanding political dynasty. Her father was assassinated by Martian separatists, and her son died while serving as a Marine. Avasarala is beyond devoted to defending Earth. Naomi Nagata (Dominique Tipper) grew up a poor Belter. A self-made and educated woman, Nagata is secretive about her past. Alex Kamal (Cas Anvar) pilots the Canterbury, which supplies water to the Belters. He speaks with a Texas twang common to the residents of the Mars Mariner Valley. After serving in the Martian Congressional Republic Navy, he went to work for Pur’n’Kleen, so he could travel the solar system. The Canterbury’s mechanic, Amos Burton (Wes Chatham), is an Earther. Like his friend Nagata, Burton keeps his past private. Medican Technician Shed Garvey (Paulo Constanzo), is the closest thing the crew of the Canterbury has to a doctor. He is also their drug dealer. Tycho Station’s Chief of Operations is Fred Johnson (Chad L. Coleman). Retired from the UN Marines as a Colonel, Johnson was a part of an infamously brutal military action. Anderson Dawes (Jared Harris) saved the disgraced Johnson’s life and enlisted him to working for the Belters’ cause. As Ceres Liaison to the Outer Planets Alliance, Dawes rallies laborers and less seemly factions, to work against the corporations exploiting the Asteroid Belt and its settlers. What do you think? Do you like The Expanse TV show? Should it be cancelled or renewed for another season? SyFy cancelled the show. Fans demanded renewal. Amazon’s Jeff Bezos is reportedly a fan of the show, so he decided to buy the rights. Season 4 (and beyond) will air on Amazon Prime Video. The Expanse is an excellent program. Won’t be able to see the new season due to being on a fixed income and can’t afford any more than cable. Unless the new season is eventually released on dvd. I hope! I love this show. If it continues to be produced, then I WILL be watching it.